Receive a solidarity and internationalist greeting from the Communist Party of the Peoples of Spain (PCPE) for the 9th Meeting of the Anti-Imperialist Front (FA) that will be held in Istanbul between September 8 and 9. It is of enormous importance for the independence and sovereignty of the peoples that the working class and popular sectors are building organizations that fight against imperialism and its instruments, such as NATO, the FMI, the World Bank, etc. In these moments of the History of Humanity characterized by the general and structural crisis of capitalism, the levels of violence unleashed by imperialism against the peoples force the need for answers through representative organizations. The Anti-Imperialist Front acquires a relevant role and responsibility by structuring itself and fighting in one of the hottest zones of the planet. The determination of all comrades and companions grouped around the FA it’s very important in the class struggle at the international level, as it’s a dam to contain the criminal actions of imperialism. 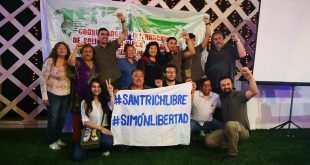 The PCPE, therefore, conveys a solidarity, internationalist and revolutionary greeting to the organizers and all those attending this Seminar, and regrets, for imponderable reasons, not having been able to attend in person to strengthen internationalism in the fight against imperialism and its barbarities . LIVE THE PEOPLE’S STRUGGLE AGAINST IMPERIALISM! LIVE THE 9th SEMINAR OF THE ANTI-IMPERIALIST FRONT!